What makes a piece of art a masterpiece? Something ordinary turned into something extraordinary; Timeless. When people refer to the slight curve of a woman’s smile; a starry night; A melting clock…these images are universally accepted as wonderful master works of art. It’s that same feeling of wonder that people find when they see a green floor made of Staybull Flooring™. 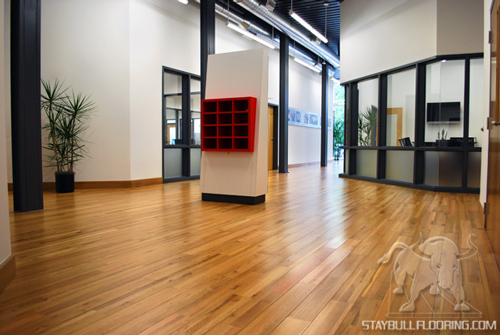 You can say that Staybull Flooring™, reclaimed flooring with a modern edge. Why? It starts with the idea behind its construction. By finding inspiration in what others saw as waste, the makers of Staybull Flooring™ created a truly special line of green flooring. You see, flooring companies leave countless tons of wood behind. This freshly cut wood is turned into reclaimed flooring using eco-friendly materials, glues, and energy-saving machinery. Want to learn more? Get a free brochure and order a free sample of Staybull Flooring™. Maybe you, too, will be inspired to create your own masterpiece. This entry was posted in Recycled Wood Flooring on October 29, 2013 by DIY Flooring. © Copyright Staybull Flooring™. All rights reserved.